Robert Dunn, Portsmouth’s second Poet Laureate, published five collections of poetry, not including the numbers of small, hand-sewn books that he distributed to people on the street. 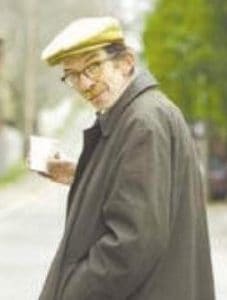 As poet laureate, Robert instituted The Hoot, a now 20-year-old monthly poetry reading at Cafe Espresso in Portsmouth, as well as creating public displays of poetry around the city and in the parking garage. Robert died in 2008 at the age of 65.